Yea, didn't mention that, but there is no CCM on the back of the neck. Real nice to see you know your stuff dude. 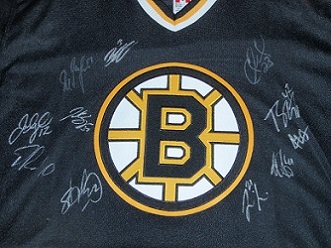 I love this era Bruins jersey.. how the lines on the sleeve are half cut. Probably my favorite style from the last 30 years. I know on the inside tag it says "CCM by Maska". Im assuming you would not call this a 'Maska' jersey, correct? Id imagine the neck tag/size tag would need to say that for it to be that step above. Im sure you can tell by now that I am COMPLETELY new to CCM jerseys.... love em though. Out of curiosity, and if you may have any idea, what do you think the jersey is worth? I have 0% intentions of selling it, but Id like to see if I got it for a good price. Paid $50 flat off of ebay (don't mind telling you guys how much). That replica isn't worth much more if anything than what you paid for it. The tags on page 1 are HUGELY helpful, but Im only in the market for replicas right now and a lot of the tags and what not don't seem to match for replicas. I.e., Eastern or Western Conf. logos next to Starter emblems. Like you said, most replica tagging doesn't match up appearance-wise to their authentic counterparts of the same era, so I would just suggest that you not get too hung up about this. If you just match up the jersey style of the replica with that of the authentic you're trying to duplicate, it's not going to be a foul or anything like that, as long as you choose an appropriate player who actually used that jersey style. A large percentage of replicas are even constructed of different materials than their corresponding authentics (like a nylon mesh authentic vs. airknit replica, etc.) so if you don't care about that, then a different tag or logo would be rather trivial in comparison. Just my 2 cents. Understood and very helpful. The CCM that I posted a few posts up is air-knit, which I find really nice. I just have no idea about the tags on neck and bottom.. but will not dive too deep into worrying or pressing on as to authenticity. The one I have is nice, and I have a KOHO coming in soon... hopefully just as nice. But the numbers? CCM 550? Are those authentic jersey? What are some of the other numbers, if there are any, that I can look for once I decide to get into the higher end jerseys? The style jersey I picked up, both the white shown and the black coming, was used during the 'later' Bourque era and the very early Bergeron era. Im kind of thankful Bergy wore this his rookie year. I intend on getting a Bergeron name and number kit when I have the $ to do so. With that said, is it worth it to put money into a kit for a replica jersey? 550 is a general code given to CCM replicas which are copies of jersey styles used from the 2000's, 1990's, and possibly even prior to that; I don't know exactly when that code officially started to be used. The only authentic jersey code you'll want to be aware of is the 6100 series of CCM, Koho and pre-Edge Reebok pro jerseys used from 2000-07. These are the square-cut, boxy-shaped jerseys (not tapered like the Edges), and the replica 550's have a similar shape to the 6100's. Of course the Reebok Edges have their own set of codes, even though you don't sound interested in them (7187 = Edge 1.0, 7287 = 2.0, 7231 = Indo-Edge). Regarding your Bruins jerseys, despite what I said earlier about the tags not mattering as long as the style was the same, there is one distinction I still make, for some reason- the late 1990's jerseys had the CCM logos on the hem, but starting in 2000 the logo moved to the back collar area. For some reason if I had a 90's CCM replica like the Bruins, I wouldn't want to put a player like Bergeron on it, who didn't play until the 2000's. I would pick one of the 2000's jerseys with the neck logo. The Koho you're getting will have this. Maybe I'm the only one who feels like this, but perhaps it's because I know that any serious collector would make that distinction if the jersey were an authentic. Thank you guys for giving me good advice on the CCM jerseys. I have made myself very distant from the Reeboks that you can get that 99.99% of the time are FAKES off of ebay... and have bought quite a few CCM jerseys that are top notch, and real might I say haha. Had I not stumbled onto this forum I probably would've had a fake Reebok signed at the charity I went to, and would've been very disappointed (minus meeting the guys :-)). Ive got a few photos attached. Check em out folks. Thanks again. Ill be putting my two cents in here and there when possible for this forum. Well... tried to upload 2 more, but now the uploader is telling me I can only upload 1.79k of a photo. Which was once 61.75?... I believe. At least I got the jersey on there. 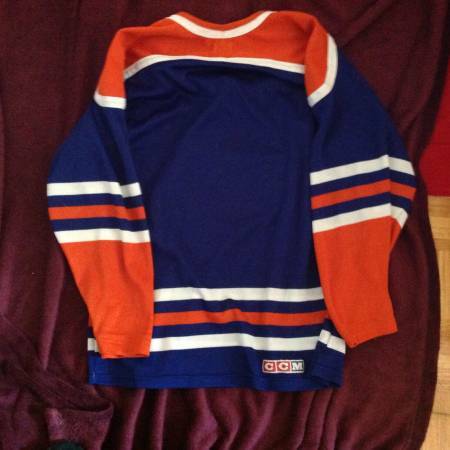 I recently purchased a Maska / CCM early 90's replica jersey off eBay. 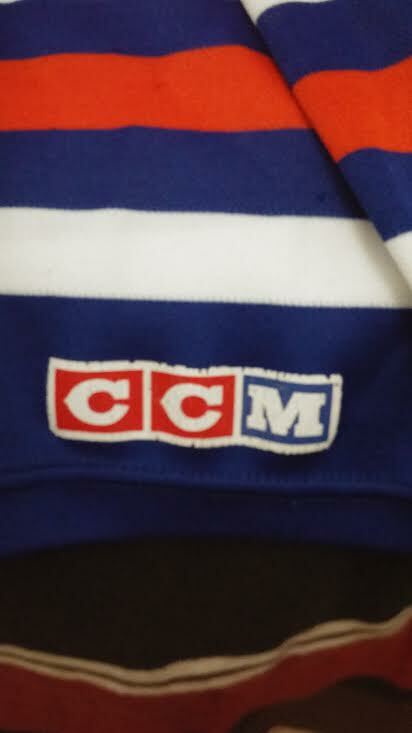 As is unfortunately common with replica jerseys from this era, the screenprinted CCM tail logo is falling off. Does anyone know where a suitable replacement logo might be found? Reason is I would like to customize this jersey (through IceJerseys, of course, like all of my other jerseys), but I'm not going to bother if the tail logo isn't able to be salvaged / replaced. Yes, I'm very OCD about my jerseys. I want to try and replace the logo... either with another logo, or with a patch, or something similar. 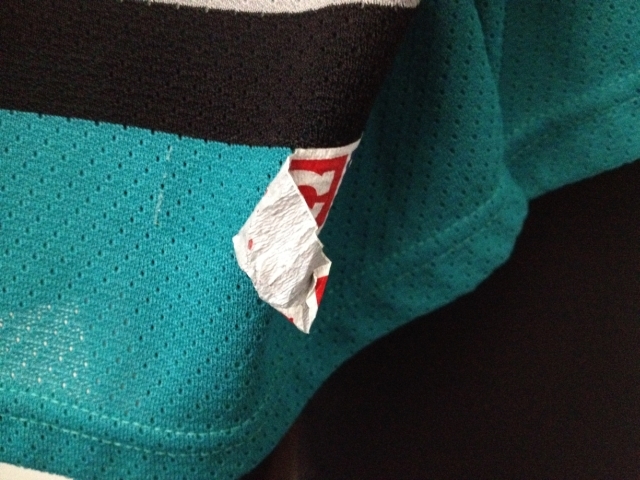 I'd just find a cheap jersey on ebay and strip the tag off it if I were you. Seems like a lot of trouble for an old Sharks replica though, authentics can be had for a reasonable price if you're patient. 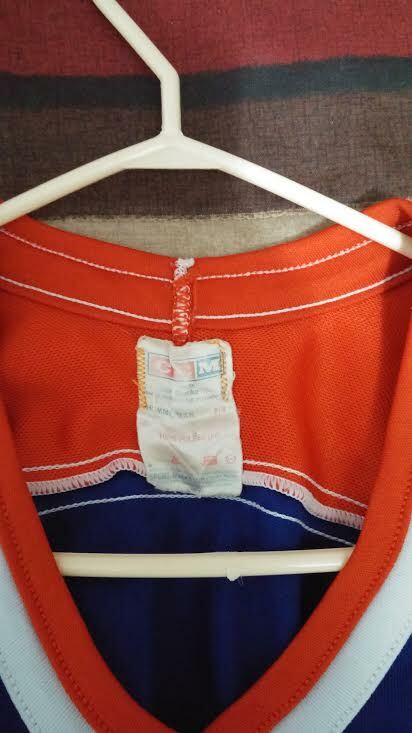 When did the NHL use KOHO necktags with the orange puck logo on the lower right hem? Specifically on the blue Rangers jerseys. The puck logo was never used on NHL game jerseys, just on replicas (CCM and Koho), from 2000 to around 2004. I have a CCM Center Ice Mikael Renberg Flyers jersey that I presume/hope is authentic, but the CCM tails logo doesn't really fit in your time table. 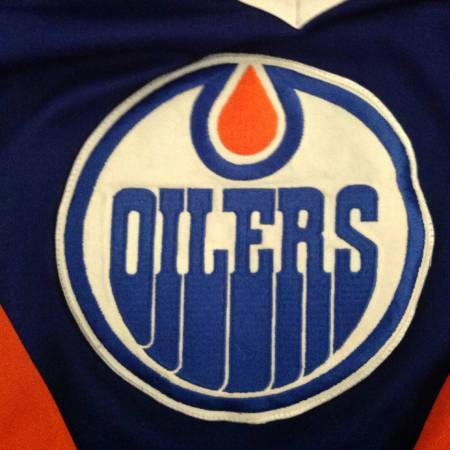 It has the CCM three-block logo in white with the classic NHL shield in orange to the right. Normally the jersey should be from his time at the Flyers from around 93-97, but the tails logos you're decribing look different for this era. Can you maybe tell me your opinion? 1.) Is there a good on NHL jerseys book available? I found that one here: Hockey Hall of Fame Book of Jerseys. Is it a good/informative read? If not you guys should write one together! 2.) 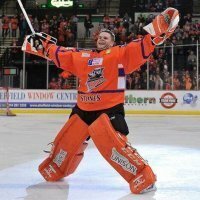 Is there a thread or website that discusses which team used which jersey brand in its history? 1) I haven't seen the book you mentioned, but I can say that we are all anxiously awaiting Slimcutta's (one of the moderators here) jersey guide, which will hopefully be published soon. 2) NHLUniforms.com is a very comprehensive jersey history website. Click on each year to see the various jerseys each team used. Keep in mind that there are occasional errors though, especially with the older jerseys. Ive got the book you are mentioning. It contains stories about HHOF players and their jerseys, worn in a specific game or period. Not really a reference guide, but surely a great book. Legendary stories and nice pictures of jerseys with nice wear. The book of Slimcutta will be the ultimate guide for all jersey lovers. Thanks LAK74 and Silverback53! Looking forward then to Slimcutta's book. Sounds really promising!!! Sat down with lawyers last week for copyright/trademark issues...all systems go so far. A rough draft is complete, but editing/proof-reading is going to take a bit before this bad boy's 100%. I am fairly new to the IJ Forums but that Slimcutta's book to be looks absolutely amazing! Yeah need a copy of that!! Hey guys i'm new to the site....i need some help. i got this jersey for next to nothing at a trade. 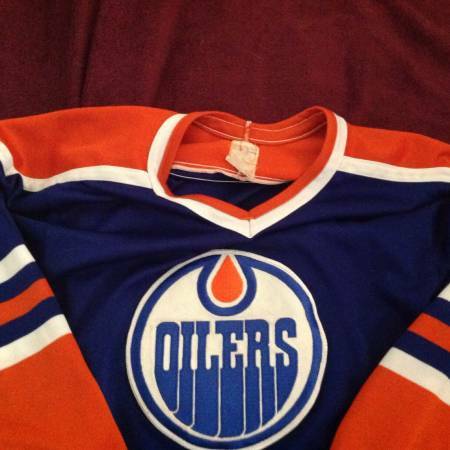 i had been looking for an older oilers jersey; i know a guy who has customized some of my other jerseys and was wondering if i could get some insight on this jersey and whether or not i should customize it (looking to slap on messier on the back).